YES!! This year I have been asked to judge the various food vendors of the International Food Row at the 51st Festival of the Arts here in Oklahoma City! What does that mean? I have no idea, but what I do know is that for two hours I will be sampling my way through the various local restaurants and food vendors offering up their creations en mass at this year’s festival.. and in some way or fashion, along with the other judges, we will come up with the Best of the Best. If you have ever been to the “Arts Festival” you are well aware of the hard work and creative bites these local vendors provide. If you are a restaurant owner or restaurant employee within a 20-mile radius, you also know this is a “slow” week for your business. There are many choices with many flavors and varying degrees of heat, sweet, and savory, in the International Food Row, so definitely something for everyone… including the famous “Strawberries Newport”! The Strawberries Newport from my brief web search seems to be an Oklahoma City thing. I could be wrong, but it’s Sunday night and Brooke the producer from "Rise and Shine" wants this recipe in by Monday, so I did not go too far in depth with the history part… other than articles on the subject that basically refers to Strawberries Newport as a “Festival of the Arts” tradition. I can surmise though, as with most food creations, Strawberries Newport with its buttery puff pastry and custard, seems to be a variation of a classical “Napoleon” or French Mille-Feuille pastry. Layers of crisp pastry and crème pâtissière topped with a shimmering glaze of ganache and decoration. Add a few strawberries in for flavor and interest and you have a “Strawberry Napoleon”. Which brings me to this week’s In The Kitchen With Scotty segment of Rise and Shine… my Mixed Berries “Newport” (actually it was my friend Kyle’s suggestion) that YOU can make at home any time of the year. Now if you are one of those people that like to hold out until mid-April for a yearly helping of “Newport”, God bless you. If you are like me and want the Newport when you want it…like now… then have my variation. The ideas are the same, the berries are a little different, and I went with my go-to “Crème Pât” recipe. Hope to see some of you at Festival of the Arts this year, and as a reminder, it is this week April 24-29, 11:00am-9:00 pm, Bicentennial Park, in downtown OKC. The best kind of sunshine in the kitchen. Preheat your oven to 400 degrees, and line a sheet pan with parchment paper or Silpat. Cut the one sheet of puff pastry into 4 equal sized squares. Brush the tops with the egg wash and sprinkle with the crystal decorative sugar. Place in the oven and bake until golden brown and “puffed”, 10-12 minutes. Remove from the oven to cool. In a large mixing bowl combine the berries. Add the brown sugar, lemon juice. and fresh lemon zest. Gently fold/toss to combine until the berries are glistening and coated. Cover and set in the fridge to macerate. Now for the pastry cream: In a heavy bottom sauce pot add the milk, along with the split vanilla bean, and gently “scald”. Scald doesn’t mean burn... that’s "scorch". Scald mean to heat gently, right below a simmer. 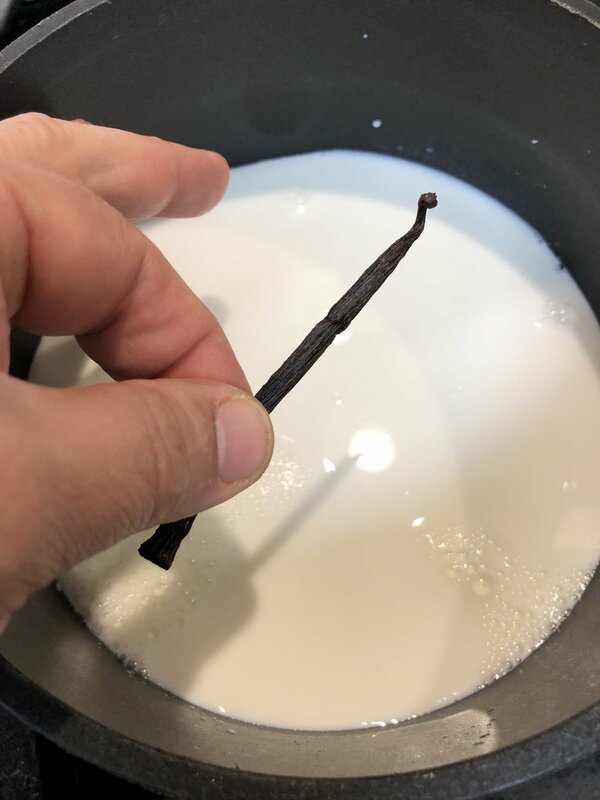 We need to heat the milk, to “cook” the yolk and steak the vanilla bean of all that delicious flavor. So, SCALD. Gently heat, and stir, until steam rises from the milk and it is thoroughly hot. While all that is going on and you have one eye on the pot so it does not boil over, in another mixing bowl add the yolks, cornstarch, flour, and sugar. With a hand whisk, whip the yolk and sugar together until it is a nice smooth pale yellow bowl of goodness. You want to be able to “draw” a figure eight with the mixture as you lift the whisk and drizzle it back into the bowl. When the “figure eight” remains on the surface for at least a few seconds, the whipping of the mixture is a success. Now we are going to “temper” the scalded milk into the eggs and sugar. Remove the split vanilla beat, careful it’s hot. Scrape out the vanilla bean caviar from inside the bean and add it back to the scalded milk. Mix in well and discard the spent vanilla bean. One full soup ladle (or cup) at a time, pour the scalded milk into the yolk mixture all the while mixing. The idea is to heat the yolks and sugar enough to cook on the stove without making scrambled eggs. Continuously add and mix until the lols are as hot as the scaled milk. Pour the custard back into the pot and gently cook on the stove until it thickens. You may have to remove the pot from the heat while constantly mixing in order to not scramble the custard. Pour the cooked pastry cream through a fine strainer to remove any coagulated bits, and press into a clean bowl. Add a few tablespoons ion sweet butter (unsalted butter) for richness and shine. Cover the surface of the pastry cream with plastic film (to prevent a “skin”) and chill in the refrigerator. When ready to serve line a bowl with a scare of puff pastry. Punch the center down to fill with a generous spoon full of your homemade pastry cream. Top with another generous scoop of the fresh chilled and macerated berries, a hearty dollop of fresh whipped cream (seriously, it’s just heavy cream, sugar and vanilla whipped until thickened) , then topped off with a beautiful sprig of mint. Serve on a perfectly sunny spring day to your perfectly sunny friends or family… or hightail it to the Arts Festival and get the original Strawberries Newport! Enjoy!